Neil Rankin, replete with tattoos and baseball cap, was one of the poster boys for London’s barbecue revolution, working at the helm of Pitt Cue, John Salt and, more recently, Bad Egg. I was surprised to learn that he has only been cooking professionally for 7 years: he studied acoustic engineering at university and worked as a sound engineer for a few years before running a highly successful sandwich shop franchise in Scotland. He then took an intensive cookery course and cut his teeth at a number of fine dining restaurants, including Chez Bruce and Rhodes 24, before having a barbecue epiphany as one of the founder chefs at Barbecoa. 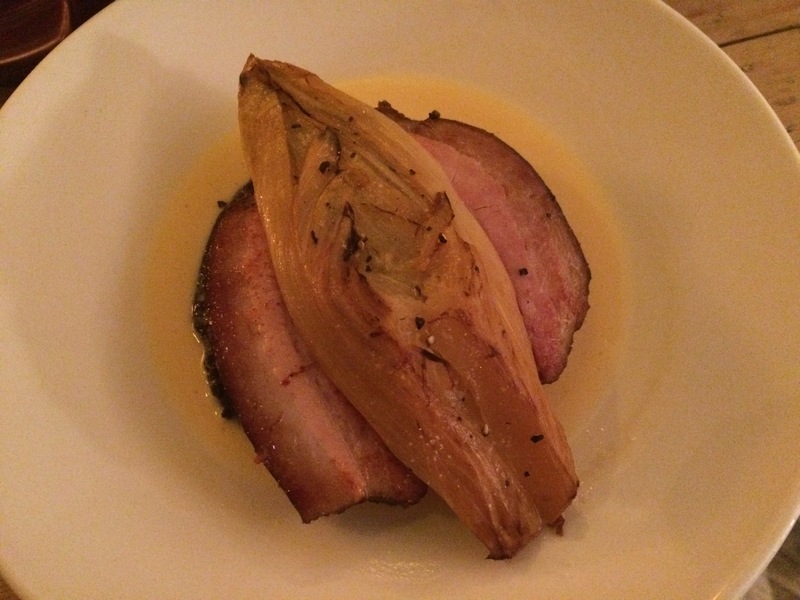 This led to his appointment as head chef at Pitt Cue. Rankin teamed up with Noble Inns to open the Smokehouse last year and has received widespread critical acclaim, including a score of 8/10 from Lisa Markwell in The Independent and 4 stars from Time Out. 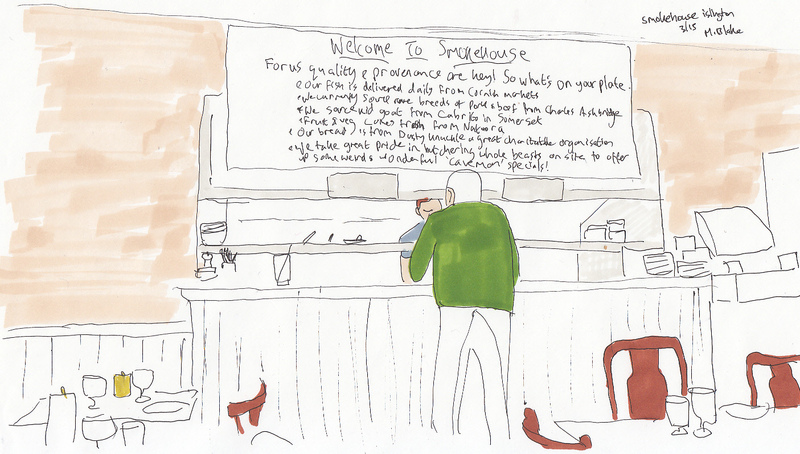 A second Smokehouse opened in Chiswick this weekend. There is an a la carte menu at lunch and dinner throughout the week and on Saturday evenings, as well as a shorter brunch menu on Saturday mornings and Sundays (offering French toast for £10, a burger at £15, black pudding and pork hash (£10) as well as a few other dishes). They have an impressive craft (mostly keg) beer collection, with a wide range of options focusing on London brewers, including Beavertown, Fourpure and Kernel (along with some stronger beers from the excellent Scottish brewers Harviestoun). Having heard that portion sizes are very generous we skipped starters and moved straight to mains, beginning with smoked pork belly, tattie scone, black pudding & apple, beurre blanc (£18). The large round of belly was served on top of the tattie scone and black pudding, it came decorated with a slice of chicory which added a hint of much needed acidity and bitterness, counteracting all of the rich, fatty flavours in the dish. The pork was only lightly smoked which allowed the nutty complexity of the belly flavours to come through, and the gelatinous fat was wonderfully sticky. The black pudding was peppery and its crunchy texture combined well with the pork. I thought the beurre blanc brought the dish together well – I was worried that it might make the dish overly rich, but whilst of course being very buttery, it had been made with a good slug of wine which added sharpness. The only disappointment was the tattie scone which had been made with too much flour and then fried for too long so that it was chewy and doughy. 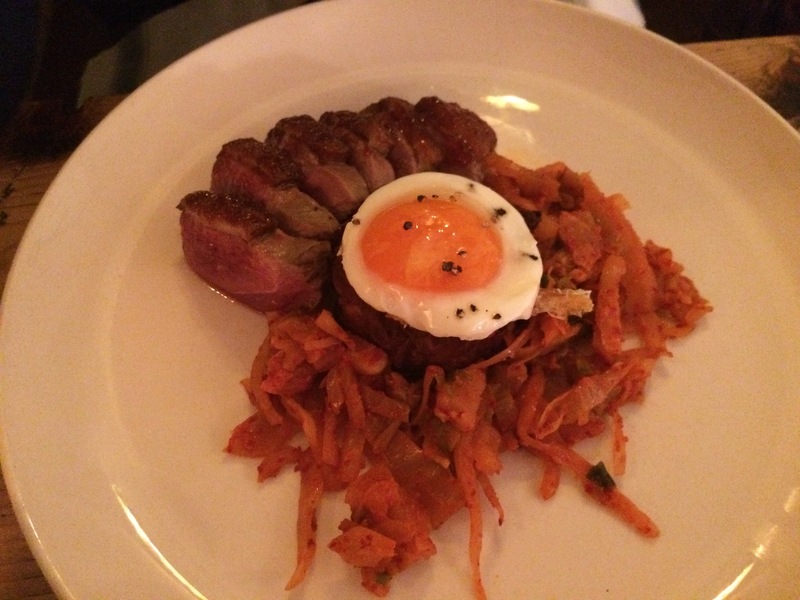 Keen to try one of Rankin’s recent experimentations with Korean food, we followed with smoked duck, kimchi, hash cake & fried egg (£18). Again, the smoking of the duck was spot on, it added interest and depth to the meat but didn’t mask it’s natural flavour; the kimchi had a nice chilli kick and brought much needed tartness to all of the bold flavours. The hash cake was crispy and well seasoned, it brought the dish together very well. Service was friendly, hip and efficient. Categories: Barbecue | Tags: Beavertown, Fay Maschler, Fourpure, Kernel, Lisa Markwell, Neil Rankin, Smokehouse | Permalink. Thanks for the recommendation Murray, the food was absolutely mind-blowing! We started off with the chopped brisket roll & gochujang which was genuinely one of the nicest, if not the nicest, thing I’ve ever eaten! I had the smoked duck which was incredible however I was painfully envious of Emily’s choice of the smoked lamb shoulder after trying it. Again, one of the nicest things I’ve ever eaten. Even the side of kale with sesame & chilli was seriously nice. We also shared their DD (Double Decker – like the chocolate bar) tart for pudding which was nice… I’m not really a dessert guy and would definitely have preferred another brisket roll! Will definitely be going back ASAP. Would it be weird to order the brisket roll x 3 for mains?! Really glad you enjoyed it! I’m definitely going to need to go back and try to brisket roll. They’ve just opened another branch in Chiswick so I’m planning to head there soon.